While eyeing things like the Jawbone Up and FitBit for the last year or so, I’ve stayed out of the fray until recently. As part of my mission to develop a better sense of empathy and understanding for what it is like to have to monitor oneself all the time, I finally started using a FitBit Ultra recently. I was skeptical, now I believe. These little things really do have the power to change behavior. It is not going to overhaul your life, but merely nudge you in the right direction. But those nudges add up to real change. I’ll admit, I was formerly a bit lazy and usually took the elevator at work, even to go up a few flights. I looked for the closest parking spot I could find to where I was going. Wearing the FitBit the last few weeks, I find myself taking the stairs at every opportunity. Where I used to take the elevator from the 5th floor of the hospital to the 11th floor in-between our Wednesday conferences, I now take the stairs. I park my car further away. Perhaps embarrassingly, I even pace up and down my halls at night while brushing my teeth if I’m a few hundred steps short of a badge, trying to reach that next level. But how do these seemingly small changes in behavior translate to real-life changes? I run and I consider myself generally to be in good shape, but in the past, when walking up to our endocrinology clinic on the 5th floor, I would get slightly winded between floors 3 and 5. This morning, I noticed that I bounded straight up to 5 without much of an issue. Even more impressive is my weight change. My medical residency and its incumbent poor diet and sleep deprivation put me up to 180 lbs. Since residency, with improvements in diet, sleep, and exercise, I have held steady at between 167-171 lbs for the last 18 months, not once wavering out of that range. However, this morning, I weighed in at 164.5 lbs, more than 2 full lbs lower than I’ve been previously. 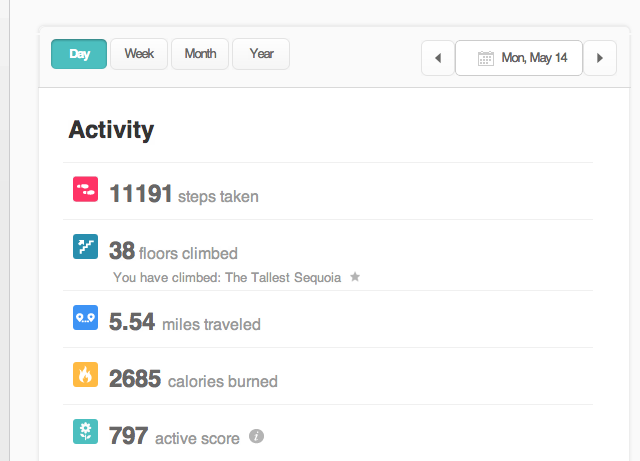 Obviously, this is very anecdotal and does not guarantee that everyone using a FitBit will see a result like this. Nor does it yet mean that my improvements will be sustained. However, it does mean that a small device that you clip on to your waist can nudge you to make small changes in what you do minute to minute and those small changes can add up to make real differences. Really enjoyed reading about the Fitbit. I have been considering one for a while so after this am going to get one. Enjoyed reading your article about the Fitbit and will be buying one now after reading this. Enjoyed reading about your experiences. I’ve had a FitBit Ultra for about two months now. It has been disturbing to have it thoroughly document just how sedentary a typical work day is for me when I’m at my desk rather than doing patient care. Like you, I find there’s something rewarding about seeing the activity rack up, and it has me bounding up the 8 flights of stairs from the train stop to street level now regularly. I’ve recently purchased the accompanying FitBit Aria wireless scale, and I’ll blog about it (www.russcucina.org) as soon as I get some experience with it.